Growing up in Northeastern Ohio, one of the first signs of spring was the running of the sugar maple sap. Warmer days and cool nights cause the sap in sugar maple trees to start heading up the trunks of the trees. Carefully placed taps collect the thin sugary sap in buckets for hand emptying or tubes leading to collection tanks. News stories and advertisements celebrating this early spring ritual would announce the start of this process and the highly anticipated breakfasts of pancakes served as fundraisers for volunteer fire departments, churches, and other groups. The best known location in the rural area east of Cleveland for seeing maple sap turned into maple syrup is the Burton, Ohio Log Cabin and Sugar Camp. Located right on the town square, the sugar house produces maple syrup in the spring and maple candy throughout the year. It typically takes 10 gallons of maple syrup to produce one quart of maple syrup. Obviously, large numbers of maple trees need to be tapped to produce commercial quantities of maple syrup. The tapping of trees and producing of maple syrup is carried out throughout the the northeastern quarter of the United States and in Canada. Of course, the popularity of pancakes (aka flapjacks) with maple syrup stretches across the United States and Canada. Traditional pancakes in the United States are made by frying a batter consisting of eggs, milk or buttermilk, flour, salt and a small amount of baking powder. 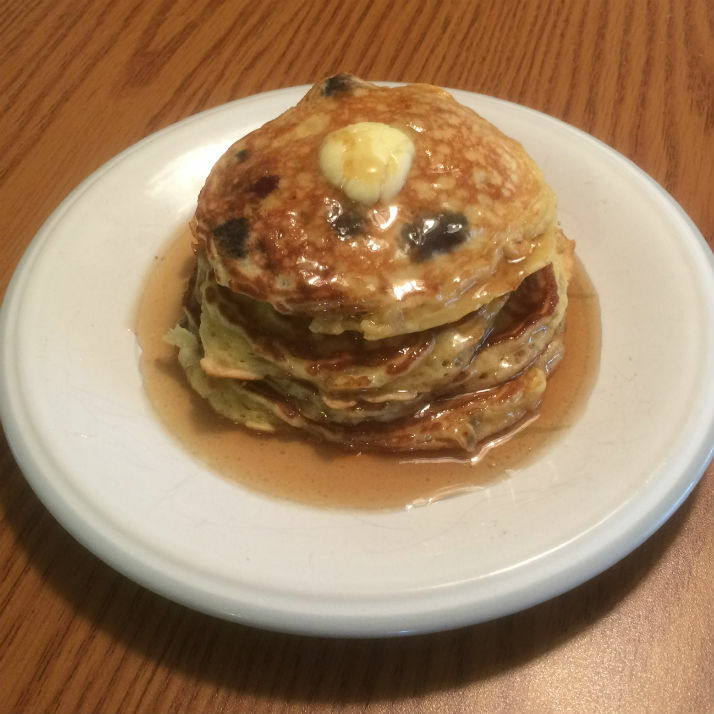 There are a wide range of variations and add-ins, such as blueberries or chocolate chips. In many Latina cultures, maple syrup is served over various types of corn bread. Now after reading this, you probably want to eat some pancakes with maple syrup. If you are making your own, choose a mix where you have to add your own eggs. Add an egg to any pancake mix that says it is complete. This will make the pancakes lighter and fluffier, which tastes better. Of course, you could also use your favorite recipe to make them from scratch. After cooking pancakes, there are usually drips and dribbles of batter that dry on the stove top and kitchen counters. This dried batter is usually difficult to scrub off. 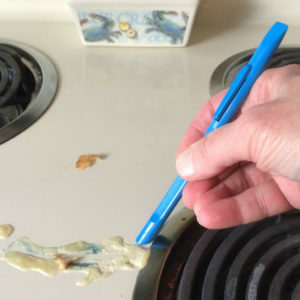 Use the rounded fingernail-shaped tip of a handy Scrigit Scraper cleaning tool to quickly and easily scrape off the dried batter spots without scratching any of the surfaces. If the batter dries along edges or in grooves, use the flat tip of the Scrigit tool to remove it.